At Apple's MacBook Pro media event back in October, the company unveiled a pair of LG-branded high-resolution displays it co-developed with the display manufacturer. 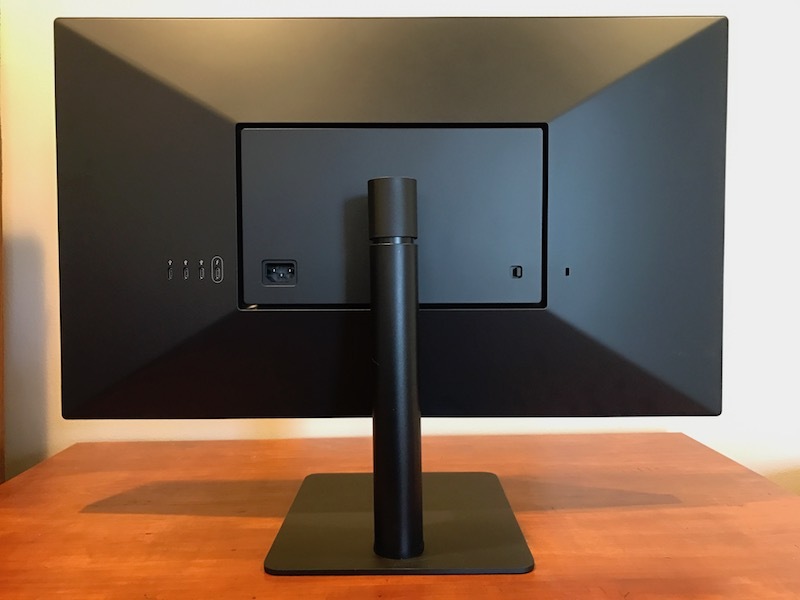 The UltraFine 5K and 4K displays are optimized for the Mac with tight software integration, and the 5K model in particular with single-cable connection over Thunderbolt 3 has been highly anticipated. Apple has just begun shipping the UltraFine 5K display, and while a handful of lucky customers received their deliveries late last week, availability is significantly increasing this week and we've had about 24 hours with ours to develop some initial impressions. 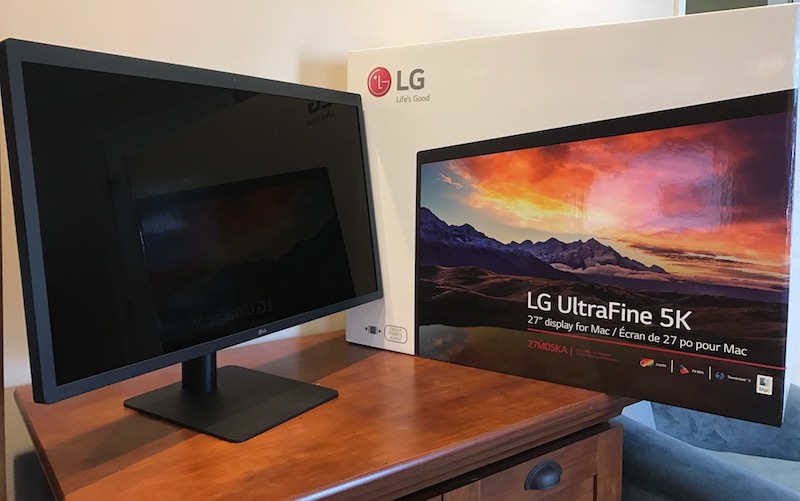 Unlike some other displays, LG's UltraFine 5K comes fully assembled in the box, making setup a breeze. Once you pull the protective sleeve off the display itself and some foam wrap off of the display's foot (and easily peel off an Energy Star sticker), it's just a matter of finding a spot for it on your desk, plugging in the power cord, and connecting the Thunderbolt 3 cable to your MacBook Pro. Also unlike some other displays, the power supply is built into the display itself, so there is no large external power brick to have to find a place for. While the display comes fully assembled, the stand can be easily removed for transport or if you wish to use a VESA arm or wall bracket for mounting the display. LG includes a separate rear cover in the box for use with VESA mounts to make it simple to convert from standing to mounted setups. The UltraFine 5K includes smooth spring and friction height adjustment, making it easy to move the display up and down over a range of 110 mm to find just the right height, while the display can be angled up or down over a range of –5 to +25 degrees. Vertical orientation of the display is not supported, although it can be rotated slightly left or right to compensate for minor leveling issues. A Kensington lock slot is included if you need to secure the display to a desk or other fixed object. With the LG UltraFine 5K able to supply up to 85 watts of power over USB-C, this truly is a one-cable solution even for the 15-inch MacBook Pro, at least for basic setups. The display includes a 1920x1080 camera, speakers, and three downstream 5 Gbps USB-C ports that provide up to 1.5 amps to allow for additional peripherals to be connected hub-style. There isn't even a power button on this display, which keeps the look and functionality clean and simple as the display automatically sleeps and wakes depending on the state of the connected computer. While it's a simple design, the fact that there's a single cable for data and power means that if you want to charge your MacBook Pro through the display, the UltraFine 5K has to be on, which may be an issue for a few users. Make no mistake, this doesn't look like an Apple display, but it's certainly not terrible. A metal foot provides solid stability, while the rest of the body is a matte black plastic. My desk setup includes a hutch and I tend to keep the lighting in my office fairly dim, so everything about this display except for the screen itself kind of disappears into the background and doesn't bother me. But if you plan to have this display sitting prominently out in the open, you'll probably notice it's not the prettiest thing on the market. Bezels are a bit larger than many other displays, particularly on the top where the camera and microphone are housed. To be honest though, when you set this display up you're not going to be looking at the bezels. It's the gorgeous 27-inch screen that catches your eye. The 218 ppi IPS display is likely an identical or very similar panel to the one used in Apple's 27-inch Retina iMac, supporting 99 percent of the P3 spectrum for improved color display. The screen itself has a glossy finish, although it does generate considerably less glare than the Apple Thunderbolt Display users may be familiar with. A Thunderbolt 3/USB-C port is the sole input available on the UltraFine 5K, which means you won't be able to hook up multiple sources such as over HDMI or DisplayPort and switch between them. The MacBook Pro uses Thunderbolt 3 over the USB-C port to drive the full 5K resolution over a single cable, while older Thunderbolt Macs can use Apple's adapter to drive the display at lower resolutions. 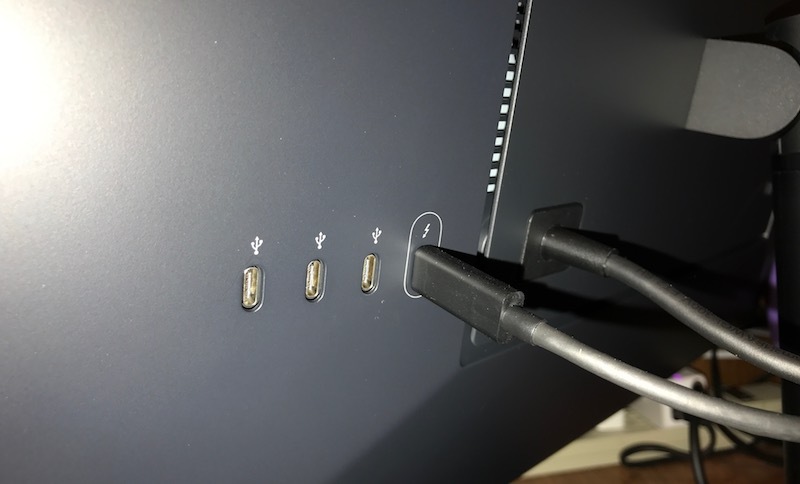 On the downstream side, the three 5 Gbps USB-C ports with 1.5 amp power delivery make for a decent connectivity hub, but the lack of USB-A ports also means you'll likely need some adapters if you want to hook up your peripherals. 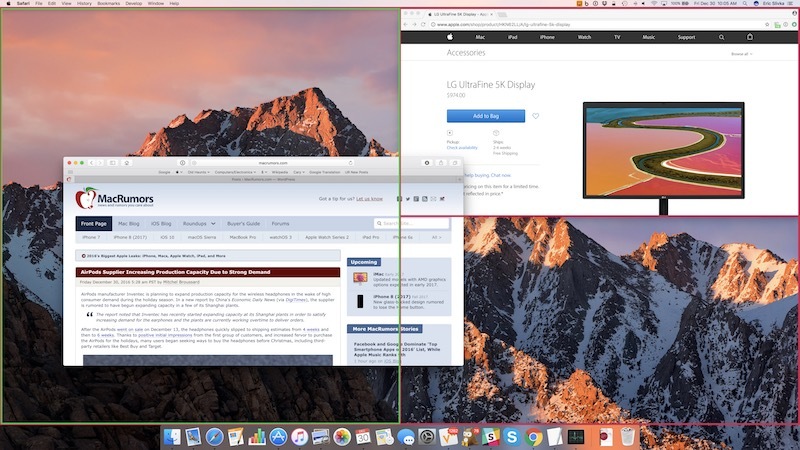 The UltraFine 5K can be managed alongside other displays within the Displays section of System Preferences, and it defaults to a Retina 2560x1440 display, taking full advantage of the massive 5120x2880 screen. Unsurprisingly, text and Retina-optimized images are extremely sharp in this mode. I've been testing the UltraFine 5K as part of a three-display setup, alongside an Apple Thunderbolt Display and the MacBook Pro's own screen. The Retina 2560x1440 display offers the same desktop size as my Apple Thunderbolt Display, which makes for a natural layout and easy transitions between displays. With its Retina display, the UltraFine 5K is obviously much sharper than the Apple Thunderbolt Display, a fact that's impossible to miss. If you prefer a different resolution for the UltraFine 5K, you can select from several other resolution options in System Preferences, including 3200x1800, 2880x1620, 2048x1152, and 1600x900. Interestingly, Apple doesn't offer anything higher than 3200x1800 as a recommended scaled option, although the full 5120x2880 (as well as 1440x810 and 1280x720 low-resolution options) is available if you hold down the option key while clicking the Scaled resolution option. Unsurprisingly, everything is really tiny at the full resolution, as this display packs a lot of pixels. 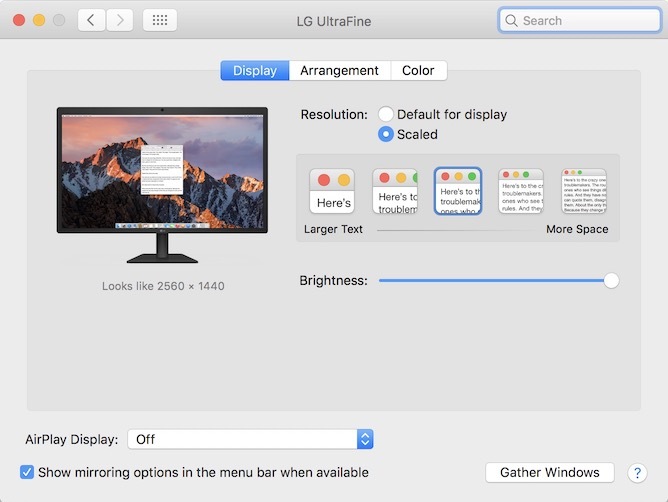 The UltraFine 5K and its 4K sibling are supported by an LG Screen Manager app for Mac, which is very similar to the OnScreen Manager app users of some other LG displays might be familiar with. LG Screen Manager supports automatic splitting of a desktop, allowing you to divide your screen into up to four sections to allow multiple apps to be automatically displayed maximized to the size of the section and preventing them from overlapping. As you drag an app to a section, other apps are automatically moved to other sections of the display and everything is resized to fit their new locations if necessary. 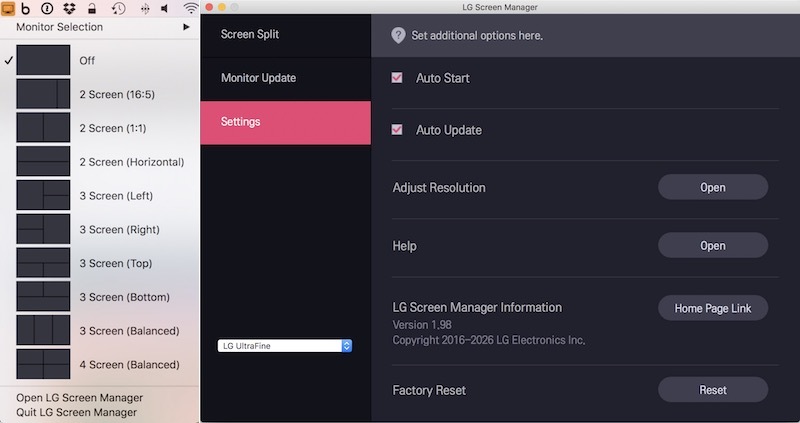 LG Screen Manager's most handy implementation is through a menu bar app that allows quick access to the different screen splitting options, but it also includes a fully windowed app that allows access to the same options, as well as software updates for the display and links to Apple's System Preferences for adjusting resolution and more. If you're in the market for a 5K display to use with your new MacBook Pro, you don't really have any other options, as the Thunderbolt 3 standard is just hitting the market. Regardless, this is a very solid display. Image quality is terrific, as anyone with a Retina iMac can attest, with accurate color representation and sharp text and graphics. The physical design may not match Apple's aesthetic, but it's serviceable and relatively non-obtrusive, while the build quality is solid. The $1299 list price is certain to give many pause given other Ultra HD and 4K options on the market for half the price or less, but with Apple's 25 percent discount dropping the price to $974 through the end of March, it really makes this display worth considering. The jump to 5K truly does make a difference compared to displays in the 4K range and the quality of this display is fantastic. The included camera, microphone and speakers are also nice additions for keeping a clean setup if you don't have high-end requirements, and many users upgrading from the Apple Thunderbolt Display would miss them if they hadn't been included. On the downside, the single input may be an issue for some, while only having three USB-C ports on the rear of the display for downstream connections isn't ideal given the USB-A world we're mostly still living in. But USB-C is the future, so the situation will only improve as more and more peripherals adopt the standard. Apple is currently the only authorized retailer for the UltraFine 5K, with online orders currently being quoted shipping estimates of 2–4 weeks and in-store pickup dates listed as early February. Apple's discounted pricing extends through March 31, so users considering placing an order should make sure to lock things in before then. This reads like a paid advertisement more so than an actual review. To be clear, LG did not pay for the post or provide the display. I tried to be fair in my assessment, although I'll admit it's a bit superficial given the limited time I've had with it, so it's more of an impressions post than a full review. The screen is excellent, while the aesthetics of the design are up for debate. They don't really bother me, but I know some people hate the design. It's subjective. I simply cannot understand why LG did not cooperate with Apple on the design of this monitor, which was clearly meant for Macs. Jony Ive could have designed something better on his lunch break. As with all things Apple... "Not as good as it used to be" The new Apple mantra. Yep, not as good as antennagate on the iPhone 4. Or as good as the first iPhones which had displays that stopped functioning. Or as good as the iPhone 3G or 3GS that took a step backwards - removing the fused glass/LCD and which allowed outrageous amounts of dust and debris in between the glass and the LCD panel. Or as good as the old MacBook Pros that had bunk CD/DVD drives. Or as good as the so-obviously-rushed iPad 3 that ran hot and was underpowered. Apple isn't perfect now. And it wasn't then, either. I think we can at least all agree that Steve is rolling in his grave at the sight of this plastic monitor. Why is that a problem exactly? I come here because I like the site. I come here for no cost, not paid a cent since joining. The odd ad isn't a problem. In fact I wouldn’t even bat an eyelid if they doubled the number of ads. ?????? Dood.... you just proved my point !!! When i say "as it used to be" you aren't going back far enough. They've made more mistakes THIS YEAR than on your 10 year long list. Most of what you list are problems or manufacturing issues. Not MISTAKES. Not mis-steps. Not being completely clueless and user hostile. YOU said "perfect" not me. Not it wasn't perfect. But it was 1000X better than is now. I used Apple products because they are beautiful, sturdy, and cooperate together. I love the harmony of the ecosystem and aesthetics. If I wanted function over form, I would buy PCs - oh wait - I did this year because Apple hasn't updated some products in years. This 3rd party device is part of a problem at Apple and their brand. I've replaced my Airport, monitors, PC, and AppleTV since the ridiculous Apple announcement of the MacBook in October - I am eyeing Google Pixel for phone and tablet in the coming months too. I even abandoned iCloud for Google services. And Siri is a joke next to Google Assistant, so Google Home will happen soon. Apple will need a big bang release of a lot of stuff at one time to really knock my socks off - but I just don't think they can pull it off. This begs for a i76700k and a 8gig RX480 not a silly 2016 macbook pro. Sad mac pro days.